* Have you checked airfare to Hawaii lately? I’ve noticed some surprising sales recently. My favorite tool to find the lowest airfare is CheapAir.com. Just enter your home and destination airports and click the “My dates are flexible” box. That’s how we recently discovered a great American Airlines deal from our home airport for about 35% less than normal fares. * Four Seasons Resort Lanai at Manele Bay completed enhancements that made awesome even awesomer. Just a couple of highlights include a stunning, fresh, new lobby design and a new restaurant, Nobu Lanai, by internationally renown Chef Nobuyuki Mathuhisa. See more information about the recent enhancements via this press release. 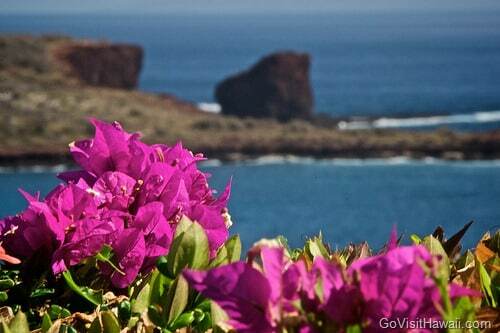 We’re aiming to visit Lanai in February to check it all out for you! * Mauna Lani Bay Hotel & Bungalows celebrates their 30th anniversary with a special 30% off room rates and $100 daily resort credit for travel through June, 2013. Garden view rooms start at $322. See more details here. * Hawaii’s Department of Land and Natural Resources (DLNR) issued a moratorium on kayaks and other personal vessels in Kealakekua Bay State Historical Park. Drift-in tour boats will continue to have access to the bay. (We are fond of the Fair Wind’s tour.) We have updated our post Planning to Explore Kealakekua Bay accordingly. * If you’re planning to hike the Kalalau Trail, I want to caution you to be extra careful and mindful of your surrounding as a potentially dangerous fugitive allegedly threw a hiker from a cliff in the Kalalau Valley in December. Aye yi yi! The hiker, who was visiting from Japan, was critically injured, treated and has been released from the hospital. This incident occurred several miles beyond the initial two-mile hike that the vast majority of hikers enjoy. (See our post on hiking the first two miles of the Kalalau Trail.) The Napali Coast State Wilderness Park has only just reopened after the investigation. For more information, see this reopening statement from the DLNR and this KITV story. Do you know of any websites similar to Cheap Air where you can just put in a one way ticket? I just found round trip from NY to Honolulu for 400 dollars, but I’d rather just purchase one way. You can do that on Expedia but you cannot choose “my dates are flexible”. Shopping for flights and vacations is such a hassle, but for Hawaii, I think it’d be worth it! You might want to try Kayak. They have a one-way ticket search plus flexible dates, however it is limited to only a three-day flexible window.